My favorite season is just about approaching! No, not "fall" so to speak. But rather, pumpkin and sweet potato season! Every day and every which way I will be craving those golden delicious flavors. 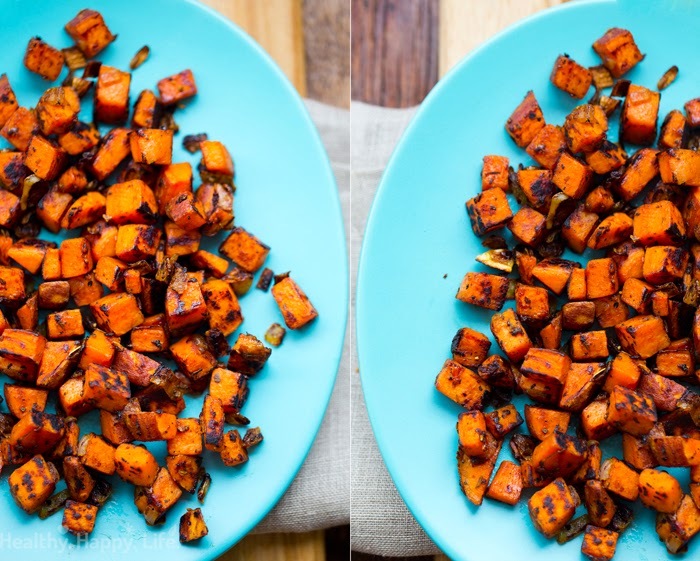 So it always helps to have new ways to prepare my fave pumpkin and sweet potato ingredients. 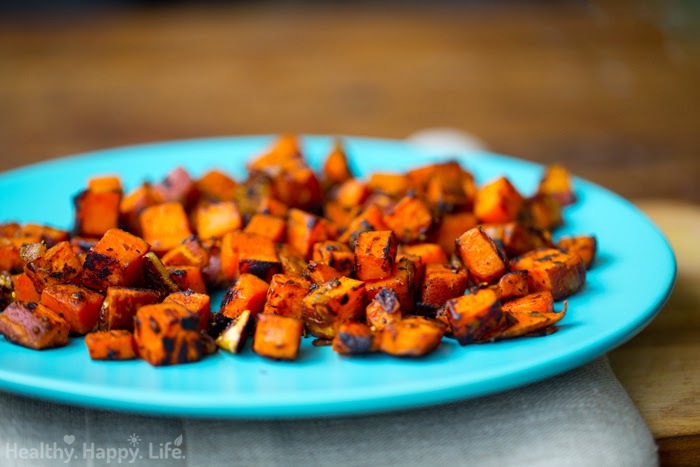 Today's recipe serves up crispy golden cubes of sweet potatoes in a simple sweet potato hash that is a copycat recipe from a favorite dining spot: TruE Food Kitchen!.. Crispy Hash. Tiny cubes, some with the skins still on, a few crispy browned onion bits, a hint of garlic, salt and pepper too. These potatoes are so yummy and versatile. Serve them at breakfast, lunch or dinner. 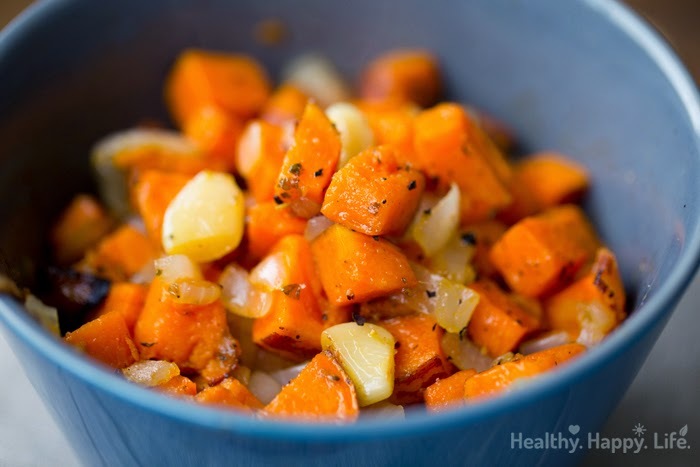 Serve them alongside just about anything for a dose of flavor, fiber, vitamin A and sweet potato coziness! One of my favorite restaurants to dine out at here in Santa Monica California is called True Food Kitchen. It is the restaurant chain by Dr.Weil and restauranteur Sam Fox. The restaurant is not vegan or even vegetarian, but they do have a nice selection of vegan menu items. My absolute favorite is the TLT Sandwich featuring smoky tempeh bacon and avocado. You can get the sandwich served with either a side kale salad (say no cheese on top!) 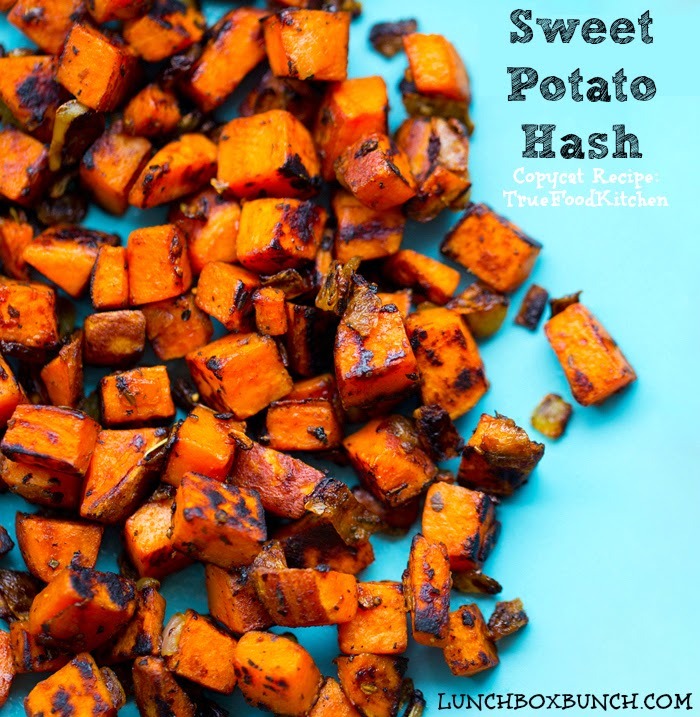 or sweet potato hash. I always get the sweet potato hash. 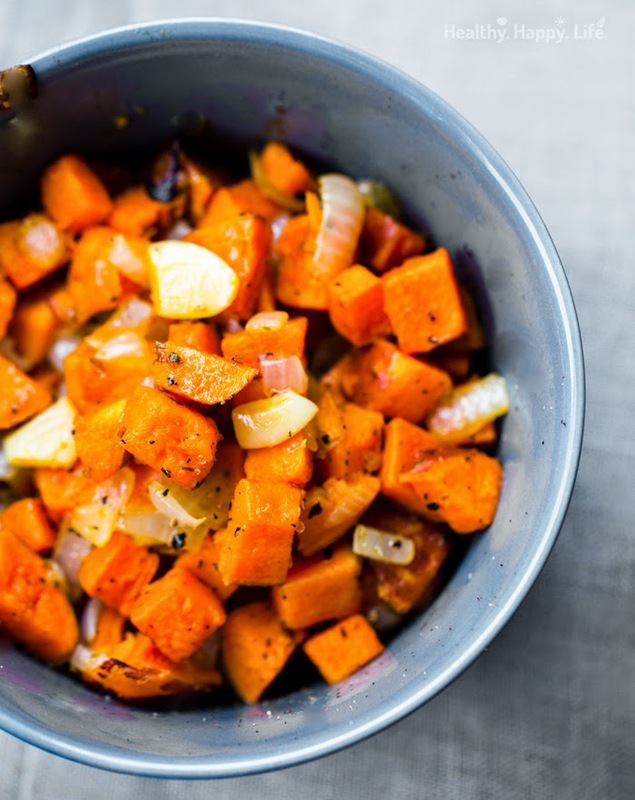 The side dish is so unique and amazing yet incredibly simple in ingredients. The uniqueness, in my analysis, is all about the preparation. So I dove into my kitchen and decided to try and recreate the recipe so that I could make these delicious potatoes at home. Success! These potatoes tasted very similar to the restaurant version. My husband even said they were better. Yup, he's a keeper! Then, a while after I made the potatoes and posted a preview on Instagram, I had a reader comment on my Insta photo about exactly how to make the potatoes! She said she works at a TrueFood. I was so happy when her process and recipe was almost exactly like what I did. The only difference is that she said they use grape seed oil, and I used virgin coconut oil. And I added some broth to the recipe for flavor and moisture.. 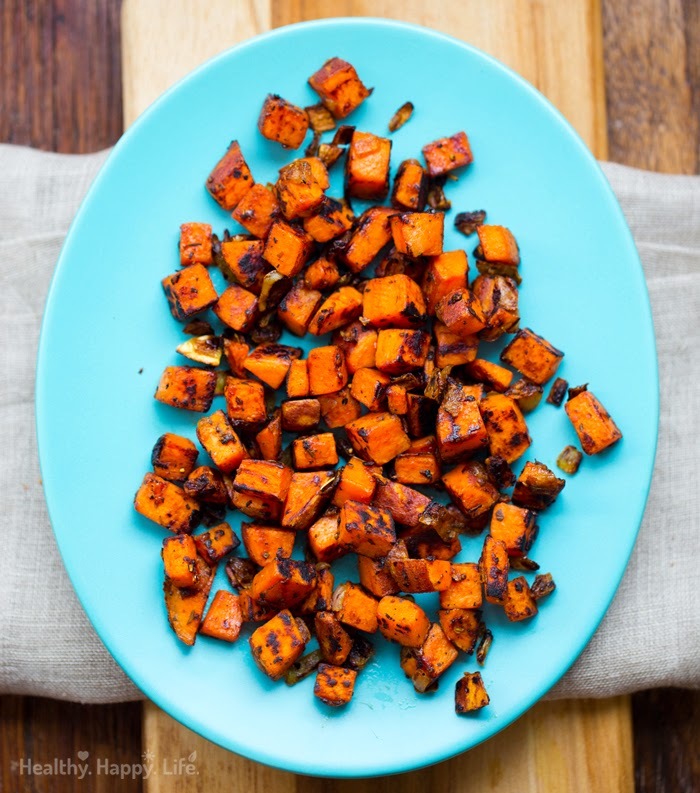 So if you love sweet potatoes like me, try these guys!.. Two versions. You may notice the plated potatoes are more browned and blackened. Well, simply put, those were sauteed about ten minutes longer than the less-browned potatoes in the gray bowl. For more blackening and crispy edges, simply cook the potatoes longer in the skillet. note: this is my interpretation of the dish at TFKitchen, this is not the exact recipe at the restaurant. I think they might use a tad more oil than I have, and they do not add the veggie broth like I do. I do that to add moisture and flavor. 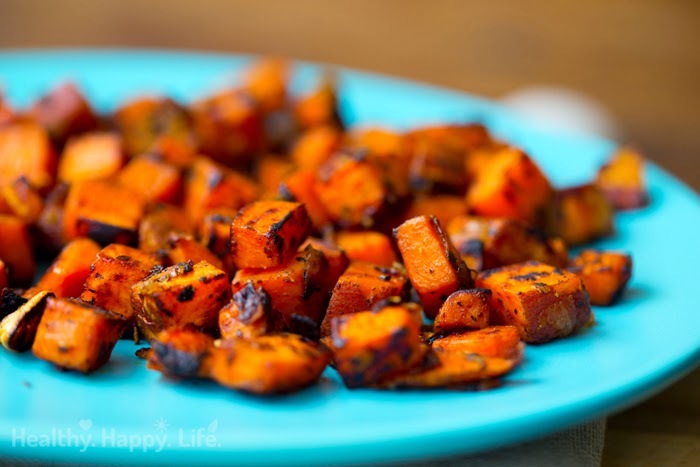 These tiny crispy cubed potatoes are simple to make and make a perfect sweet potato side dish! Serve in place of french fries for a healthy option side. For the potato, wash and scrub skin very well to remove any grit. I scrape away about 1/4 of the skin, leaving a partially peeled potato. The skins should be mostly kept on because they make the hash nice and crispy, and they also add fiber and nutrients! 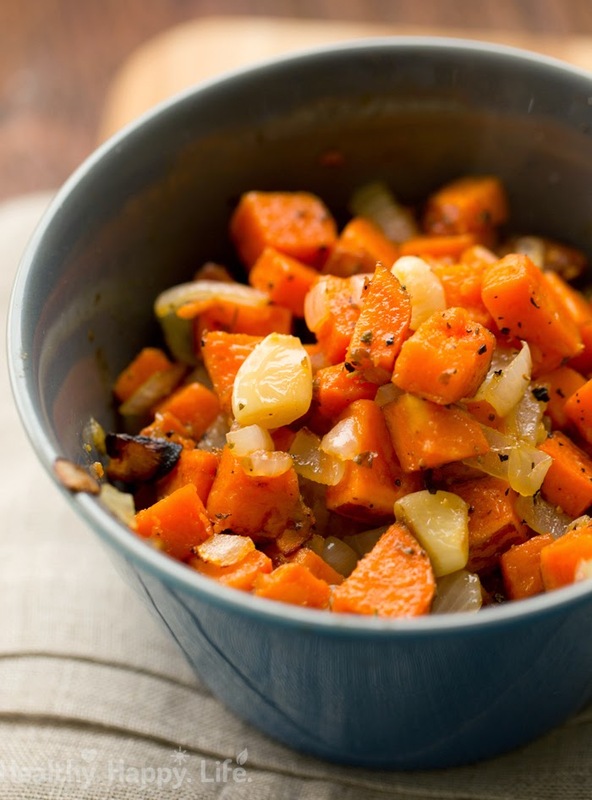 In a large mixing bowl, toss the potatoes with the vegetable broth, oil and garlic. Pour the potato mixture in a glass baking dish and roast at 400 degrees until the potatoes are tender, but not mushy. Usually about 25-35 minutes. Warm a skillet over medium-high heat. Add 1/2 tsp of oil. Add the onions and saute for about five minutes to soften.